This is the lowest I've seen for this great action cam. The Black version gives you the best stabilisation, 'gimbal-like' according to reviews. 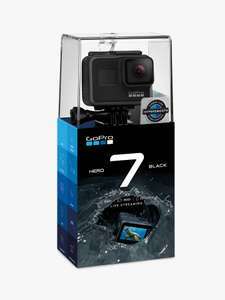 GoPro's HERO7 Black action cam combines top-notch 4K UHD visual quality with gimbal-like HyperSmooth video stabilisation. An intelligent photo mode delivers 12MP photo quality, optimised with HDR. It's rugged and waterproof without a housing, and is easy to control with an intuitive touch screen. Connected to the GoPro app, your shots transfer automatically to your device and you can live stream, tag GPS location, share your work in an instant, and create your own QuikStories mini movies with the Quik app (apps available on iOS and Android). For the sake of 6 quid, I don't know why anyone would choose eGlobal over JL. Loss of quality when using stabalisation. Monday morning started expensive ! That was pretty much the opinion I came to when the £320 deal came up, there's a lot of recent reviews which consistently report crashing/freezing and erratic batterylife and on the Gopro forums there's many long threads on the same issues. I do appreciate you'll always find more problems on support forums but the complaints are very consistent and I've been here before with the GoPro 3 Black which was a frustrating device to use. I feel although £300 is a good price it's too much to risk. Expired. Back to £329 at John Lewis and Amazon. I've been looking at getting this via the gopro site using student … I've been looking at getting this via the gopro site using student discount and for me it works out cheaper there (£329 minus 20% discount = £263.99). This is good if you don't have access to student discount though. And they still have the cheek to claim there is an £80 saving. Still available at Argos/Currys/Jessops for £299. Bought one last night - will be interesting to see how long it lasts before I send it back due to poor battery life etc after reading a lot of reviews. yes their algos prob noticed few ordered and ramped the price up again..Go …yes their algos prob noticed few ordered and ramped the price up again..Go Via the John Lewis side its cheaper.I can sort out the 5% vouchers for anyone if anyone is willing to take the risk of "trust"
Presumably pay them some money to get a gift card for you, hence the element of trust. Instead of that, you could search through HUKD for any of the old Midcounties Coop deals that allowed you to get an Xexec account; that offers 4% off a voucher. Bought one last night - will be interesting to see how long it lasts …Bought one last night - will be interesting to see how long it lasts before I send it back due to poor battery life etc after reading a lot of reviews. Battery life could be better, but then you can buy spare batteries, or carry a USB powerbank around. So you bought something with a view to send it back, because of some …So you bought something with a view to send it back, because of some shortcomings you already know about? Very strange...Battery life could be better, but then you can buy spare batteries, or carry a USB powerbank around. Because of some shortcomings I read about after purchase - yes. I have a GoPro 3+ and fairly satisfied with it, so I already know what to expect, however, wasn't quite expecting to hear the battery life is 60% worse than the 3+. Because of some shortcomings I read about after purchase - yes.I have a …Because of some shortcomings I read about after purchase - yes.I have a GoPro 3+ and fairly satisfied with it, so I already know what to expect. Then why are you expecting to return it, if you already know what to expect??? Then why are you expecting to return it, if you already know what to …Then why are you expecting to return it, if you already know what to expect??? Tried this myself with no lucky The discount isnt stackable, still works out the student discount from the RRP of £379 down to £303.